After 11 years since its founding, The Japan HR Society (JHRS) is now embarking in its next stage of growth and development. Effective Sept 1, Yoshiharu Matsui, Ed.D., MBA and one of the hosts of JHRS' AskHR Forum took over as JHRS Chief Community Officer and Managing Editor of The HR Agenda Magazine from its Founding CCO, Jun Kabigting, MBA, MSIE, SPHRi who will be pursuing his MA/PhD studies in Positive Organizational Psychology at the prestigious Claremont Graduate University (CGU) in California, USA from Spring 2019. 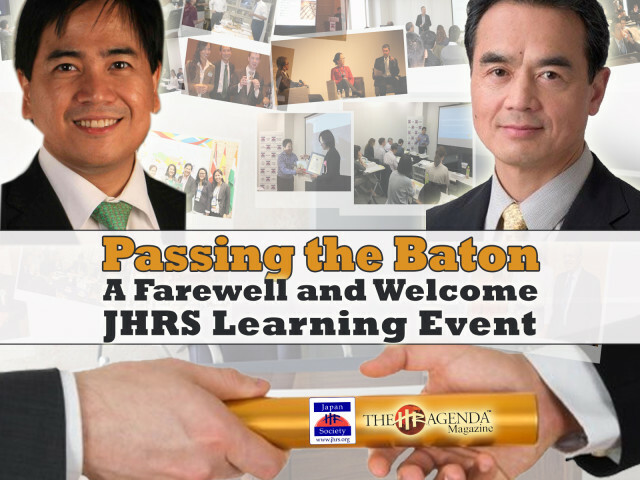 To mark this milestone, the society invites all of JHRS members, partners, magazine subscribers, friends, and supporters to this event and be a witness to a historic transition of leadership in JHRS history. Join in a night of good food and drinks as you network and re-connect with fellow JHRS community members and celebrate the new beginning of JHRS and The HR Agenda. The event will also feature a short presentation of outgoing CCO Jun Kabigting's new framework for HR called “Positive HR: Positively Reinventing HR” which might represent the next stage of evolution for the practice of HR Management in Japan and the rest of the world. Venue: AP Shinagawa Annex, Takanawa 3-23-17. All participants will get a free copy of the 7th Year Anniversary of The HR Agenda - Japan's first & only bilingual magazine, published since 2011 by The Japan HR Society (JHRS).